We have years of extensive experience in providing the skilled care necessary to preserve thousands of hand knotted rugs and hand woven kilims, including treasured family heirlooms, collectible museum-quality antique rugs, and pieces appreciated for their decorative value in clients’ homes. 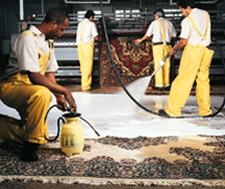 As we often illustrate on our blog, to repair and restore rugs and kilims is a skill and labor-intensive process, which can include: sourcing the right yarns to be used for the repair or restoration protecting the surrounding areas around the damage rebuilding all damaged or missing warp reknotting pile while recreating missing or damaged motifs weaving weft to tighten knots or to recreate missing motifs as in the case of kilims binding selvages (selvedges) to prevent the edges from fraying binding and rebuilding fringes to prevent unraveling We believe that combining these steps to restore a handmade rug or kilim is an art form in which we take great pride. 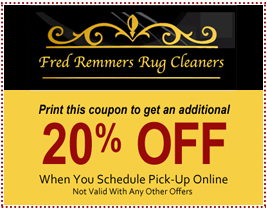 Here at Fred Remmers, we provide a full range of superior kilim and rug repair and restoration services, including those necessary to address the following common problems faced by rug and kilim owners: worn fringes holes and/or torn areas moth damage pile wear kilim unraveling selvage (selvedge) wear. 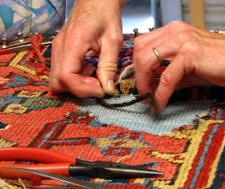 Our professional rug repair team is committed to providing our clients with the knowledge they need to make informed decisions about how to care for and preserve their rugs and kilims for years to come. 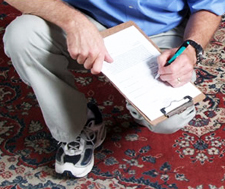 As such, we provide free inspections of all clients’ rugs and kilims in need of repair or restoration. During these inspections, we provide detailed explanations of the various repair and restoration options available to our clients. In addition, we provide clear and detailed information regarding the price of all repair and restoration options available to our clients. 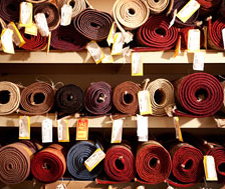 Get in touch with us to repair your rug!